Victory Infratech Pvt. Ltd. Established new project of Victory Crossroads at Sector 143 B Noida Expressway. Victory Crossroads Noida offers 3 BHK and 4 BHK Luxurious Apartments with vitrified, designer and modern amenities. Victory Crossroads Noida is a celebration of that space; Crossroads Noida is a statement to compliment the spirit of every aspiring an individual in today’s world. 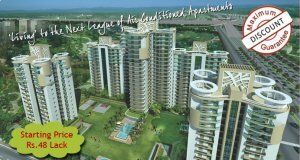 It is just at the doorstep of the upcoming Metro Station, facing the Noida Expressway and the FNG Experssway. Amidst green and clean Environment with only 16% of constructed area. The society has functional club with modern facilities and its turn up with ultra modern amenities and ultra excellent Modern Feature. Victory Infratech is a professionally managed. It is an era of prosperity in an Indian real estate industry is growing. A team of enthusiastic entrepreneurs and experienced professional envision the value of time in this sector and planned to step into the real estate segment in order to make differences and consequently. Victory Infratech Pvt. Ltd. saw its own overview.